Echa un vistazo a mis otros artículos! ¡¡¡ NECESITAMOS SU VOTO POSITIVO, A MAYOR NÚMERO DE PUNTUACIÓN, PRECIOS MÁS ECONÓMICOS!! 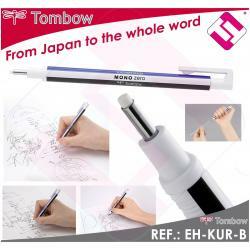 !TOMBOW PORTA GOMAS PROFESIONAL PRECISION 2,3MM INGENIEROS ARQUITECTOSThe innovative eraser MONO zero is available with two differently formed tips for precise erasing: Round tip in 2.3 mm diameter and rectangular tip in 2.5 x 5 mm. It is an essential utensil for all professional or recreational use that requires pinpoint erasing. The slim casing is available in different colours, including a striking neon assortment (round tip only). The MONO zero has a push mechanism with metal lead. It is easily refillable. Recycling ratio approx. 90% of gross weight. Awarded with the iF product design award 2010 and the red dot design award 2010.